Gyeon Mohs is an easy to apply ceramic coating that adds a durable layer of protection to your paint! If you are looking to show off your paint without sacrificing durability, but simply do not have a ton of time to devote to detailing, paint coatings could be your answer. 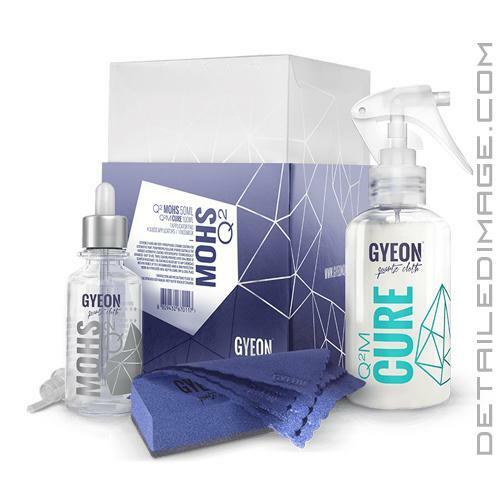 Gyeon Mohs is pretty easy to apply and comes with simple, yet detailed instructions within the package. Each added layer will improve overall durability, gloss and scratch resistance. In order to achieve the very best results, Gyeon recommends applying 2 layers, 3 layers at the absolute most. The hardness of average car paint is approximately 3-4H and Mohs will add another layer that is 3-4H! This dramatically improves your vehicle's ability to resist environmental contamination, swirls, RIDs, etc. Mohs however is not "too hard" and still reacts to the changes in the environment such as temperature and humidity. This allows the coating to be "flexible" in a way, meaning that even though it is hard enough to protect, it is still soft enough to not develop micro-cracks that can hurt looks or longevity. Once cured, Mohs will easily last up to 12 months or 12,500 miles and the hydrophobic qualities will have you standing back to admire the tight uniform water beads. If you are looking for a coating that will wow you with looks and durability, the Gyeon Mohs may be the one you should try! Bonus: Box includes Mohs, applicator, 4 suede cloths, facemask, 1 Cure 100ml, and detailed application manual. Through years of testing various professional and consumer coating products, I have come to appreciate certain aspects of individual products. One thing I am most appreciative of is how user-friendly a product is during application in a variety of environments. Gyeon has stated that Mohs was an easy to use product, and I am happy to report that they are spot on. I was working in a less than accommodating environment that consisted of very high humidity and temperatures above 90 degrees Fahrenheit (typical Midwest Summer). Even with these extreme conditions, the coating was an absolute joy to work with. Extremely hard and very hydrophobic ceramic coating for automotive paint. Perhydropolysilazane hybrid coating is the hardest automobile coating ever developed. Technologically advanced, easy to use. Triple coating provides over 50% more of scratch resistance. The coating is resistant to any chemicals with pH from 2 up to 11. Work in a ventilated area, keep in a dark, dry and cool place. I highly recommend this product. Installed on a black BMW X5. The black that was already pretty glossy, got even more shiny. Didn't think that was possible. Very easy to apply, great quality product. This is my first coating application. James Melfi's excellent blog was the reason I selected MOHS Q2. The application process was stress free. The gloss was acceptable and I am hoping to see more with follow up applications of Can Coat and Cure. I would recommend MOHS to others who want to experiment with coatings. The 30ml was just enough to accomplish 3 coats. Liking the MOHS so far. Application when around 60 degrees in garage was remarkably easy, wipe on, wait a minute, wipe off. So far, so good. Self cleaning abilities seems nice, not as 'high gloss' as some of the 'candy-coatings' go (i.e. Gyeon Prime) but a nice reflective, warm appearance. Looking for durability on this one, have it on a fleet vehicle so we'll see how it holds up over time with 'low maintenance'.